Looking at a computer screen for a long time? 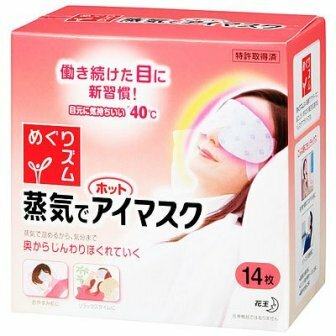 If so, you’d better use this disposal steam eye mask from Kao!!! You don’t need anything to use the eye mask, you just open and put on your eyes just like a regular eye mask. For ten minutes, 40 degrees centigrade steam comes out. So you can use it at office, in a plane or wherever. But you have to be careful; it puts you to sleep easily!! Many uses fell in love with this eye mask after they used it because it feels so good. There are three types; unscented, lavender and chamomile. The price is five-piece box is about 500 yen (US$5.40), so each one costs only about 100 yen (US$1.07). It’s cheaper than a cup of coffee!